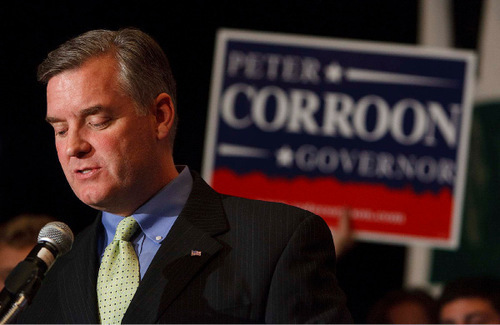 Combative race ends in a landslide: Incumbent rides his party's wave to earn two more years. 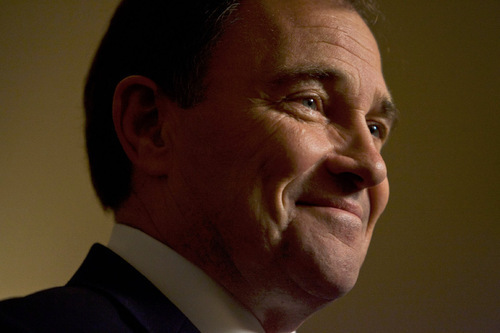 Chris Detrick | The Salt Lake Tribune &#xA;Gov. 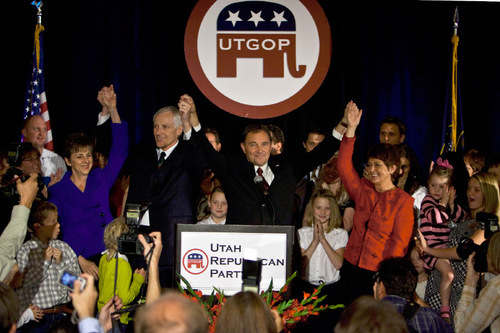 Gary Herbert speaks at the Salt Lake Hilton Hotel Tuesday November 2, 2010. At his right is First Lady Jeanette Herbert. At left is Lieutenant Governor Greg Bell and JoLynn Bell. Chris Detrick | The Salt Lake Tribune &#xA;Gov. Gary Herbert speaks at the Salt Lake Hilton Hotel Tuesday November 2, 2010. At his right is First Lady Jeanette Herbert. At left is Lieutenant Governor Greg Bell and JoLynn Bell. Steve Griffin | The Salt Lake Tribune&#xA;&#xA;Utah governor Gary Herbert gives his supporters a "thumbs up" as he claims victory in his race against Peter Carroon during the Utah GOP election night celebrations at the Hilton Hotel in Salt Lake City Tuesday, November 2, 2010. 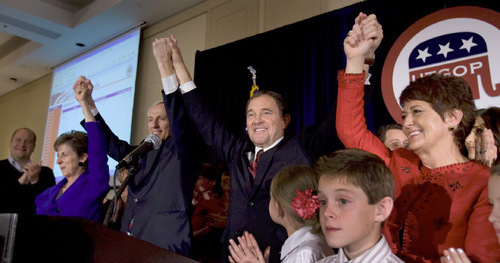 Steve Griffin | The Salt Lake Tribune&#xA;&#xA;Utah governor Gary Herbert and First Lady Jeanette Herbert raise their arms in victory with Lieutenant Governor Greg Bell and his wife JoLynn Bell as they claim victory in their race against Peter Carroon during the Utah GOP election night celebrations at the Hilton Hotel in Salt Lake City Tuesday, November 2, 2010. Chris Detrick | Tribune File Photo Gov. 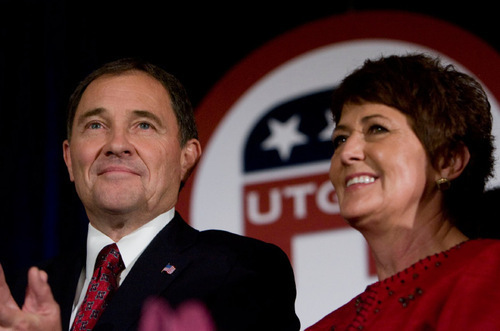 Gary Herbert's campaign intends to raise more than $1 million at his main fundraiser of the year, the Governor's Gala. The expected record fundraising could be a sign he expects a challenge from other Republicans or, possibly, Rep. Jim Matheson, D-Utah. 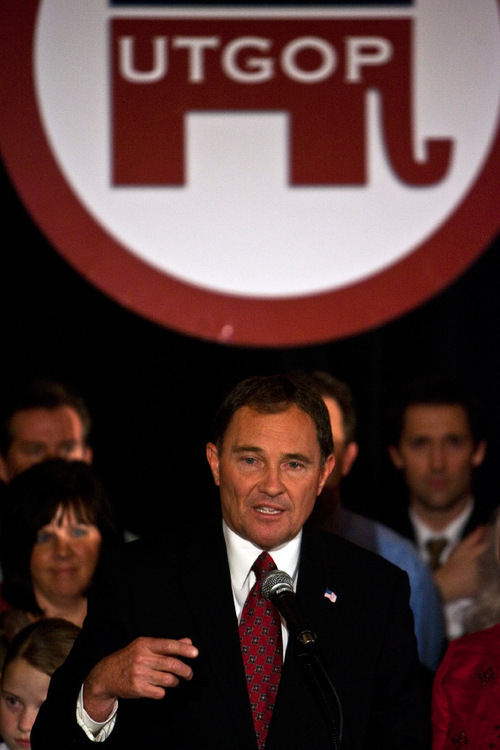 Chris Detrick | The Salt Lake Tribune &#xA;Gov. 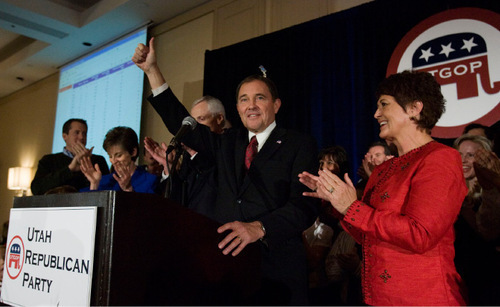 Gary Herbert speaks at the Salt Lake Hilton Hotel Tuesday November 2, 2010. At his right is First Lady Jeanette Herbert. At left is Lieutenant Governor Greg Bell and JoLynn Bell. Chris Detrick | Tribune file photo Gov. Gary Herbert vetoed four bills from the recent legislative session. Lawmakers are counting heads to see if they have the two-thirds majority to call an override session. Chris Detrick | The Salt Lake Tribune &#xA;Gov. 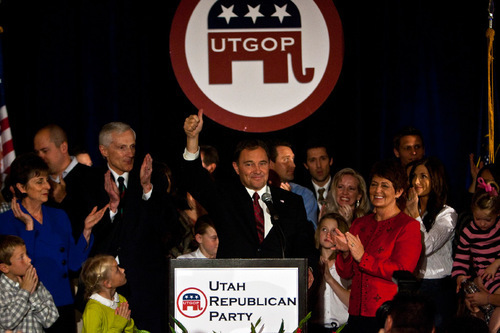 Gary Herbert speaks at the Salt Lake Hilton Hotel Tuesday November 2, 2010. At his right is First Lady Jeanette Herbert. At left is Lieutenant Governor Greg Bell and JoLynn Bell. Chris Detrick | The Salt Lake Tribune Gov. 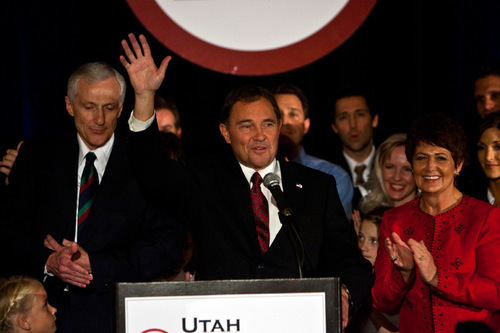 Gary Herbert speaks at the Salt Lake Hilton Hotel Tuesday November 2, 2010. At his right is First Lady Jeanette Herbert. At left is Lieutenant Governor Greg Bell and JoLynn Bell. Steve Griffin | The Salt Lake Tribune&#xA;&#xA;Utah governor Gary Herbert and First Lady Jeanette Herbert are greeted by supporters during the Utah GOP election night celebrations at the Hilton Hotel in Salt Lake City Tuesday, November 2, 2010. 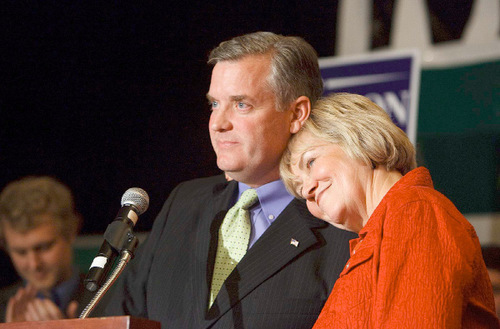 Trent Nelson | The Salt Lake Tribune&#xA;Sheryl Allen rests her head on the shoulder of her running mate, Peter Corroon, Democratic candidate for Utah Governor, makes his concession speech on election night at the Salt Lake City Marriott Tuesday, November 2, 2010. Trent Nelson | The Salt Lake Tribune Peter Corroon Trent Nelson | The Salt Lake Tribune&#xA;Peter Corroon, Democratic candidate for Utah Governor, makes his concession speech on election night at the Salt Lake City Marriott Tuesday, November 2, 2010. Leah Hogsten | The Salt Lake Tribune&#xA;Democratic Salt Lake County Mayor and Utah Governor nominee Peter Corroon was joined with his running mate State Representative Sheryl Allen, with her husband John (right) during his concession speech at the democratic party headquarters Downtown Marriott Hotel on election night Tuesday, November 2, 2010, in Salt Lake City.&#xA; Leah Hogsten | The Salt Lake Tribune Democratic Salt Lake County Mayor and Utah Governor nominee Peter Corroon talks to supporters on election night. One of Utah's most contentious, hard-fought governor's races in decades has reached its end, with Gov. Gary Herbert keeping the office he inherited 15 months ago. Democratic challenger Peter Corroon, the Salt Lake County mayor, conceded shortly after 10 p.m.
"We have some challenges out there, but as we work together, we will find solutions," Herbert said to a cheering crowd. "I'm humbled by the challenge, the opportunity. I don't shrink from it. Our best days of Utah, I believe, are ahead. I promise you I will give it my all." Once seen as the best shot in three decades for Democrats to win the Governor's Office, Corroon was unable to overcome a Republican tide in a decidedly red state and his relative anonymity outside the Wasatch Front. Corroon, who will serve as mayor until 2012, assured his chanting supporters that their work during the campaign earned them a seat at the table. "Tonight, I want to tell you your voices have been heard. I give you my word that these issues that you care about are the issues I will continue to fight to fix," Corroon said, specifically focusing on education, ethics reform, fair redistricting and renewable energy. While the conclusion was without drama, the campaign was a hard-fought, high-priced contest, with Corroon's campaign issuing a memo titled, "Governor for $ale," questioning whether Herbert's big donors received special treatment, state contracts and tax breaks under his administration. 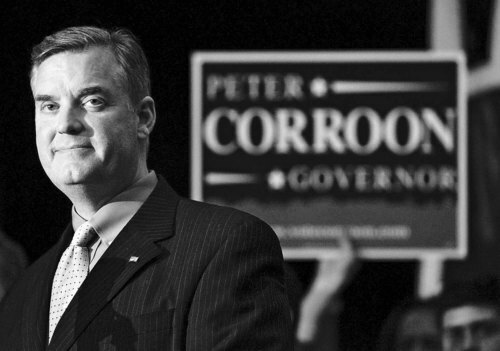 At one point, Corroon's ads called the Herbert system "corrupt," and Corroon compared the Herbert administration to that of the convicted former governor of Illinois, Rod Blagojevich. Herbert adamantly denied any wrongdoing or preferential treatment for donors, and he plowed ahead with his fundraising. All told, the two campaigns raised and spent more than $4.4 million, making it the second-most-costly gubernatorial race in Utah history. For Herbert, who ascended to the seat after Gov. Jon Huntsman Jr. left office in August 2009 to become the U.S. ambassador to China, it marks his first electoral victory outside Utah County. He will serve for two years before he is up for election again in 2012. 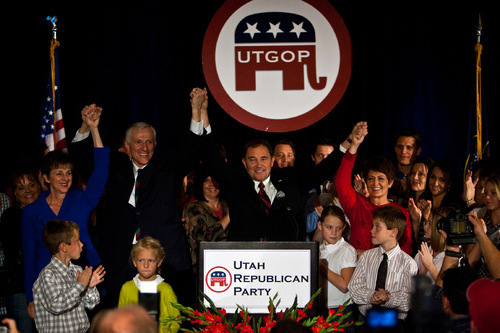 Herbert ran as a supporter of public education  winning the backing of the state's largest teachers union  and the Huntsman-Herbert fiscal record, including accolades from Forbes magazine, the Pew Research Center and others, which praised Utah for its sound fiscal management. The governor said he would stay the course. "We'll maintain ourselves as the envy of this country ... the best place to live anywhere in America and, I would say, the world," Herbert said. 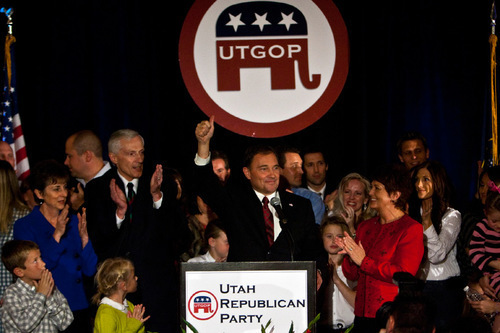 On social issues, Herbert has distanced himself from Huntsman, taking a skeptical view of climate change, opposing a statewide anti-discrimination ordinance to cover gays and lesbians, and supporting direct confrontation with the federal government over gun laws, land management and health reform. Corroon campaigned on education and bipartisanship, promising to provide more money to bolster Utah's per-pupil spending, which ranks last in the nation. And he picked state Rep. Sheryl Allen, R-Bountiful, as his candidate for lieutenant governor, the first time the state has seen a bipartisan ticket since gubernatorial candidates began picking their running mates. "It's a race that probably many of us thought would be much more competitive than it turned out to be, and part of it clearly had to do with the nature of the times," said Matthew Burbank, chairman of the political-science department at the University of Utah. "It's a very Republican year in a very Republican state, so any Democratic challenger is going to have a really hard time." Corroon also had a tough time sustaining the questions he raised about Herbert's fundraising, which may have given him a better shot at an upset, Burbank said. Herbert doesn't anticipate much change in his approach and management style. 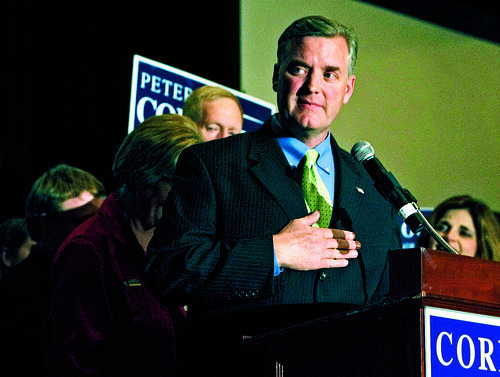 When Herbert was being battered by Corroon's campaign, Republican insiders suggested that he would have a GOP challenger when he runs again in 2012. But on Tuesday night, he wasn't looking that far ahead. "I'm overwhelmed at the support of the public. It's heartwarming. It's humbling," Herbert said. 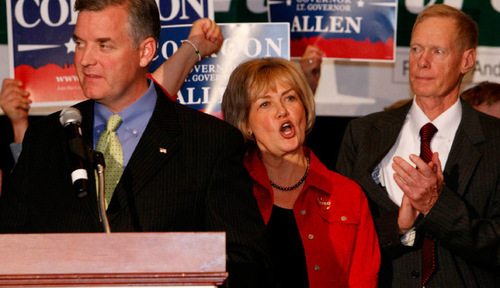 "It just makes me want to redouble my efforts and work harder than ever to be a good governor for this great state." Tribune reporters Matthew LaPlante and Cathy McKitrick contributed to this story.